This thread is to post pictures and discuss your setups specifically for the SR-25. With the gaining popularity of the rifle, I think its about time we had a thread just for the SR-25. This will be along the lines of the LMT MWS .308 thread, and can be a one stop discussion and show us your setup thread for your SR-25's. Anything SR-25 goes. Ill start it off with my ACC and APC. Last edited by Jwknutson17; 07-10-17 at 13:45. -Test target of .997 MOA. 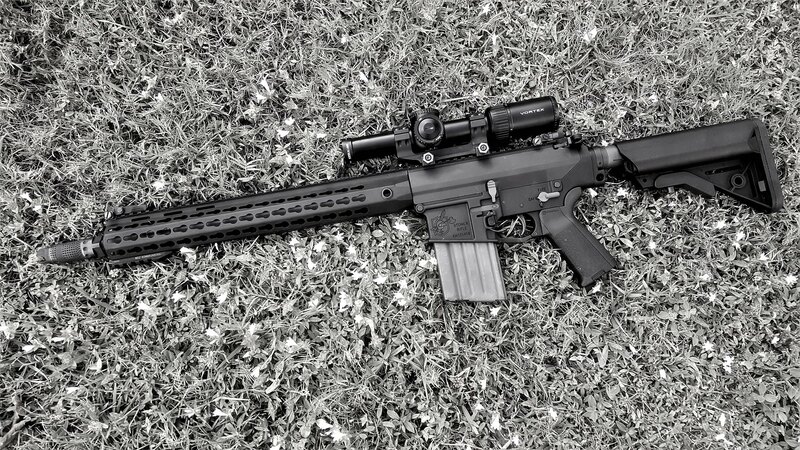 -I picked this rifle as a compromise between an APR and an ACC as to me it filled both roles. Last edited by Jwknutson17; 07-10-17 at 13:43. -Test target of 1.18 MOA. -I felt the APC filled the precision role for me in a small package and I wanted more of a 308 battle rifle. The ACC fills that role. There is overlap in the two for sure, but I wanted to be able to run one hard, and the CL barrel of the ACC will take that abuse. Yes, yes I'll be subscribing to this thread. Last edited by jpmuscle; 03-07-17 at 16:41. Subscribe? I'm going to print those pics out and put them in a dang magazine. Like Oui or Penthouse but for guns, and not all the articles. Because NO ONE READS THE ARTICLES!! Yes they are that awesome! Last edited by 03scgt; 03-07-17 at 20:09. Last edited by Jwknutson17; 03-07-17 at 21:57. It's just a range toy without a light, IMO, and that's too much money to spend on a track-only car, so to speak! Why did you go M300C? I would think the rail is long enough to allow for an M600 without getting the head into the muzzle blast, or causing you to have to compromise how you held it? Am I wrong?